Tramadol is an analgesic pain reliever that is similar to other opioid narcotics although it has a relatively weak action on opioid receptors in the brain. Tramadol is prescribed under the brand names Ultram, Ultram ER, and Conzip. It also acts on the neurotransmitters, serotonin and norepinephrine, to enhance its analgesic properties and is prescribed for moderate to moderately severe pain. While Tramadol may be considered safer than other opioids, it can lead to dependence and subsequently, withdrawals when discontinuing use. Tramadal abuse can lead to withdrawal effects. 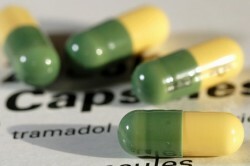 The maximum daily dose of Tramadol is 400mg with a recommende dosage of 50mg to 100mg every 4-6 hours. Extended release Tramadol comes in dosages of 100, 200, and 300, mg. Taking more than the recommended dosages can produce drowsiness, sedation, and a high for which it is commonly abused. Tramodol abuse has increased for 2 main reasons; Tramadol became a preferred prescription painkiller by medical professionals under the notions that it was not a scheduled narcotic by the DEA and had a low potential for abuse. However, effective August, 2014, Tramadol was placed into Schedule IV of the Controlled Substances Act by the DEA, according to the U.S. Office of the Federal Register. The second reason Tramadol abuse has increased is that, despite being considered a safe and non-narcotic pain reliever, those who would abuse the drug have discovered that it produces similar opioid effects, is easier to obtain, and is perceived safer to abuse, possess, or divert to others. Obsessing over the next dose or preoccupation with Tramadol use. Denying or minimizing dosage amounts used. Using Tramadol after pain conditions subsided or using it for other purposes. Using Tramadol to avoid withdrawals or other unwanted conditions. Obtaining Tramadol through fraudulent means such as lying to doctor to get more, stealing, prescription forgery, or doctor shopping for multiple prescriptions. Loss of interest in family or activities where abuse is discouraged.